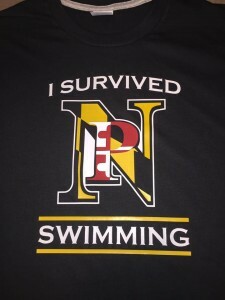 Congratulations to the graduating seniors of the North Point Swim Team! Surviving Coach Rivenburg is quite an accomplishment. These custom tees were made using Port & Company’s Essential Blended Tees; a soft cotton hand feel joins Dry Zone® moisture-wicking technology for unbeatable comfort and performance. The design is made with red, white, and yellow SportFilm Lite from Stahl’s. Need a few or a few hundred? I can do that!